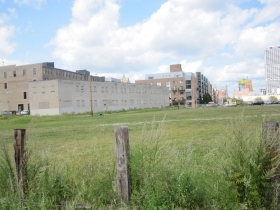 New 50,000-square-foot building could transform the Milwaukee Ballet. 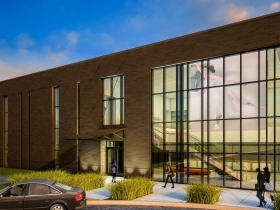 Rendering of Milwaukee Ballet’s proposed building at 132 N. Jackson St. 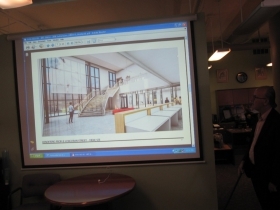 Rendering by HGA Architects and Engineers. A school, rehearsal, performance space and administrative building for the Milwaukee Ballet was approved by the members of the Historic Third Ward Architectural Review Board at a meeting today. Described as “a tall big warehouse you can dance in,” by Jim Shields, the Design Principal of the Milwaukee office of HGA Architects and Engineers, the 50,000-square-foot facility is to be constructed on a portion of the Italian Community Center’s 138,331-square-foot property at 132 N. Jackson St. 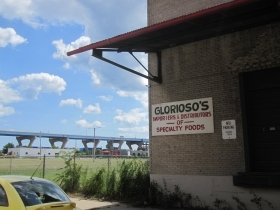 The building is to be located immediately east of the Glorioso Brothers warehouse at 537 E. Corcoran Ave., and would be at the foot of N. Jackson St., where it would be particularly visible to those looking south on that street. Shields took that visibility into account in his vision for the structure. 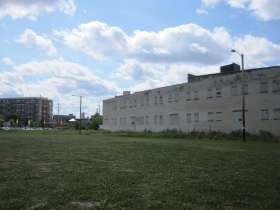 A two-story window facing N. Jackson St. on the west half of the north wall of the 32 foot high building would reveal a “hive of activity” within, and identify it as a public facility. 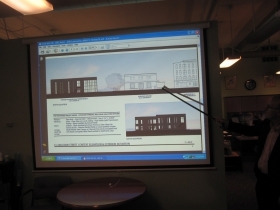 A scrim, commonly used as a screen in dance staging, would hang inside the window, and would have images of dancers rear-projected onto it, further animating the building and its environs. An open staircase will be visible, and glimpses of the rehearsal and community spaces will be seen from the street. There will be studios with glass walls, seven rehearsal rooms and a balcony where students can study and do their homework. Two rehearsal stages will be the same size as the Uihlein Hall stage, where the company performs. To rehearse in a space the same size as the performance space is a significant consideration in its own right. Imagine if the Milwaukee Bucks only had a half-court to practice for their games. The walls would feature dance photography as a design element. The building would also include a “Community Studio,”available for rental by “the many dance groups that are operating on more of a shoestring budget than the ballet, if that’s possible. Dance is not as lucrative as you might expect,” Shields added in his best deadpan. (There will be a gift shop in the new building.) 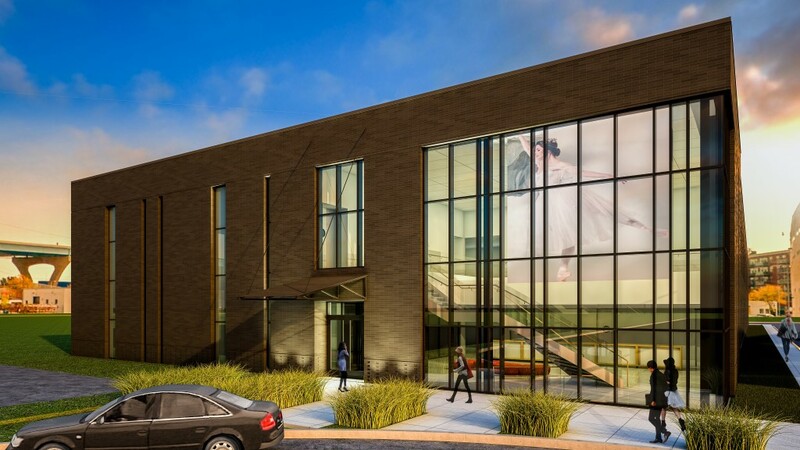 The whole “establishes the ballet as an important new resident of the Third Ward,” Shields told the panel, drawing a parallel with the rehearsal and community space that the Florentine Opera has opened in Riverwest. 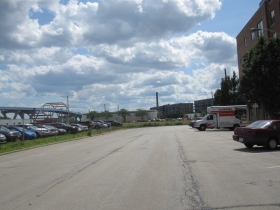 The site is the former coach yards of the Chicago & North Western Railway. In 1910 no fewer than 12 railroad tracks ran across the property in a northeast direction as they fanned out from the C&NW Swing Bridge #1556, a block to the south. The railroad’s freight terminal was located to the north, and the site was heavily used by the manufacturers and wholesalers of the district for import and export. Since large trucks would park transversely on the street to load and discharge their goods, N. Jackson St. is particularly wide at this point, Shields said, running all the way to the property line to the east, with no sidewalk. His design anticipates an eventual sidewalk on the east side of the street, and has located the entrance where the street terminates. “The street terminates into the building, and the building responds in kind. 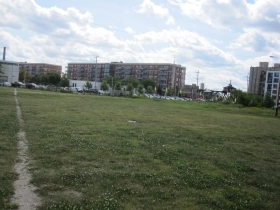 This is a public space, not an office or a warehouse,” Shields said. E. Corcoran Ave. poses its own set of challenges, since it, too, terminates at this spot. Shields said he has spoken to Rocky Marcoux, the Commissioner of City Development, about the advisability of extending that street to the east. But for now, the property line lies right at the planned facade of the building. Although Shields would like windows on the east half of the north face of the building as well, fire codes prevent that due to the possibility that another structure could be built right up to it. He plans to put in windows, backed with fire resistant drywall in the hope that in “five years or so,” a new street would remove those restrictions, and the windows could be opened up. Furthermore, the site may have residual environmental contamination, which means the contractor, Catalyst Construction, will have to move gingerly with the site work. 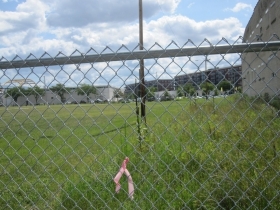 A visit to the property shows at least three monitoring wells on the site. Shields told the panel “the surrounding buildings are all brick,” and that he proposes the same material for this one, which is an apostasy for some. Not only does Shields plan to use brick, he proposes to lay them according to traditional masonry techniques to provide a “highly articulated crafted surface. You can see that masons have been here,” Shields said of the ultimate effect. The masons will employ such classic techniques as banding, setbacks, recessed headers, corbelling, and the use of 16-inch-wide, dark bricks glazed to a matte sheen, laid at the base of the structure and to a height of three feet in a Flemish Bond variant. This will keep the hod carriers on their toes. Shields has specified a nearly black Belden brick, and showed a sample to the panel. He was inspired, in part, he said, by how Milwaukee’s Cream City bricks are blackened by time. “The bricks look like they were burnt. Like they were held in a kiln for a day or two,” Shields said. 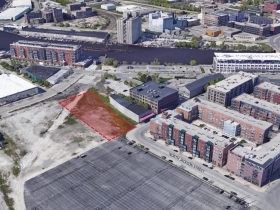 The Architectural Review Board gave its unanimous consent to the proposal, with member Michael DeMichele recusing himself since his firm is working with the Milwaukee Ballet on the project. Shields will return in the future with a proposal for the signage, explaining that the ballet is undergoing a rebranding at this time. 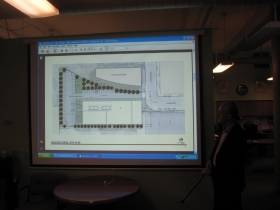 The committee was also pleased with the solution for the 61-stall surface parking lot, which is designed to be screened from the street by the building and vegetation. Some hope was expressed that a pedestrian and bicycle path be built to provide direct southbound access from N. Jefferson street’s terminus to the proposed Trestle Park. Shields said he would take that into consideration and discuss it with his client. 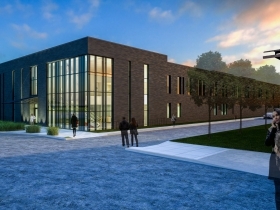 The Milwaukee Ballet will be 50 years old in 2020, by which time its offices, school and some of its programs should be in residence in this new facility. It will continue to operate at its location at 504 W. National Ave. According to its 2014 IRS Form 990, the ballet had income of $5,729,069 in 2014, split nearly equally between contributions and program revenue. The Ballet School was accredited by the National Association of Schools of Dance in 2008, and claims to be “the only professional studio school in the Midwest, and one of 13 nationally.” The status of the school helps students get work visas, provides academic credit and conveys other benefits (including favorable insurance terms) to the school and its approximately 1,000 students. The school produced revenue of $1,415,348 in 2014, and had expenses of $934,927, including a $141,700 grant, so its revenue helps to subsidize the other expenses of the ballet, which include salaries of about $3,000,000 per year. We’ll see what happens. My first choice for a location for the Ballet would be in Westtown–either on Wisconsin Avenue between 4th and the River or around the Germania Building. (Clearly, I have not been consulted.) 😉 I would see that as further activating the area that will be the new home for the Symphony, and is already so close to the Riverside, Rep, etc. A district with a preponderance of performing arts. Down here in Chicago, the Joffrey Ballet’s space with big, floor-to-ceiling windows overlooking State Street is impressive–you can look up a couple stories and see rehearsals going on during evening rush hour. I respect Shield’s work a lot. This design looks so simple and, in a way, bland. It looks rather suburban with all that adjacent empty space. I get that it’s just a drawing. Let’s hope that its strategic placement on the ICC lot is an indication that more development is planned on the rest of the land. The remaining property is just a big rectangle crying for developing, and even reintegration into the street grid. Year 12 of the 5 Year plan. Good Luck.